Geneva - The continued airstrikes by the US-led coalition in Syria have resulted in atrocities against civilians in the eastern city of Deir al-Zour, says the Euro-Mediterranean Human Rights Monitor, warning that the airstrikes are conducted in violation of the rules of discrimination and proportionality under international humanitarian law. The US-led coalition is responsible for killing at least 118 civilians in recent days, 50% of whom are children as part of its indiscriminate bombing of the Islamic State strongholds in the city. The war on terrorism cannot justify the targeting of civilians or even families of IS fighters, said Euro-Med Monitor, pointing out that the coalition raids continue to inflict dozens of civilian casualties among Syrian and Iraqi citizens, mostly from the families of IS members, who came from Iraq to the villages and towns of Deir al-Zour and its surroundings after the group was eliminated from Iraq. The deadliest airstrike on civilians was carried out two days ago (Saturday, November 17) in the village of Aboul Hassan near Hajeen village in the countryside of Deir al-Zour. The raid targeted a number of houses in the vicinity of the village mosque, killing 36 people, including 17 children and 12 women. While coalition forces admitted carrying out 19 raids in the area over the last two days, they denied responsibility for the raid that led to the deaths of civilians, claiming that there were no civilians in the targeted areas. However, eyewitnesses confirmed that civilians were killed in an airstrike by the coalition. 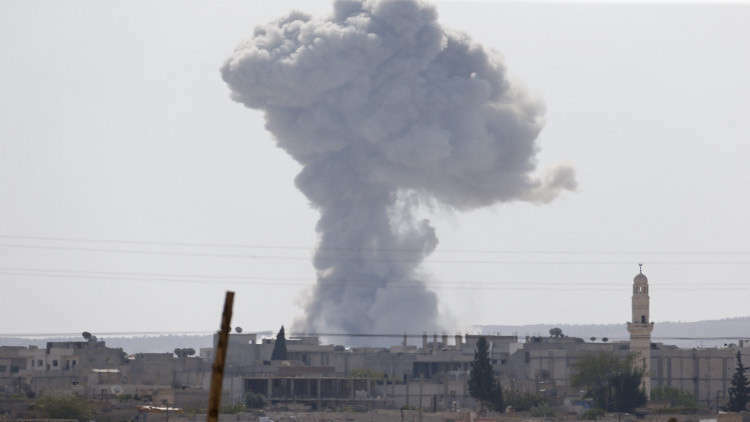 The US-led coalition said that 10 other airstrikes were conducted by other forces, calling on what they called “other players” to end such attacks across the Euphrates River. Another airstrike was carried out on Wednesday, 14 November, targeting houses in al-Susah town, east of the Euphrates, killing 16 civilians (12 children and 4 women). On Sunday (November 11), 32 civilians were killed, including 13 children, most of them were family members of ISIS fighters. On 8-9 November, eight civilians (5 children and 3 women) were killed in raids targeting houses in al-Shifa town, in the eastern countryside of Deir al-Zour. Another airstrike targeting Hajeen town east of Deir al-Zour on Friday, 9 November, killed 26 civilians, including 13 children. The targeting of civilians in Deir al-Zour constitutes a grave violation of international humanitarian law, said Sarah Pritchett, Euro-Med’s spokeswoman, in particular the rule of distinction, which requires combat forces to distinguish between combatants and civilians, and the rule of proportionality with regards to the civilian cost of a military action. Although the Coalition forces claim that they are trying to spare civilians the repercussions of the fighting, the military operations they carry out seem to be blind when it comes to targeting civilians, added Pritchett. These raids against civilians were not the first to be carried out by the coalition forces, as two massacres have been committed against civilians last month. One of them was by targeting a mosque full of worshipers during Friday prayers in al-Susah town on 19 October. A day earlier, the Coalition forces conducted an airstrike on Ammar bin Yasser Mosque in the same town, killing about 66 people. The Euro-Mediterranean Human Rights Monitor calls on the US-led coalition to spare the civilian population the repercussions of its military operation and to take all necessary precautions to avoid such horrible incidents from occurring a second time. ISIS is also urged to move away from residential areas. The group should not use such incidents to radicalize civilians. The presence of the movement in civilian areas is endangering their lives and constitutes a clear violation of international humanitarian law as well. A humanitarian disaster in Deir al-Zour and its countryside is already unfolding due to frequent raids by the coalition, further warns Euro-Med Monitor, stressing that the continued bombing of the town will result in a huge crisis, in which civilians will pay the heaviest price. Euro-Med Monitor also calls on the international community to take responsibility for these violations that may amount to “war crimes”, calling for exerting pressure on the coalition to abide by international humanitarian law.